In December The Root profiled the American Legislative Exchange Council, or ALEC. The organization connects corporate leaders with state lawmakers to draft "model bills" for legislators to replicate, introduce across the country and ultimately pass into law, state by state. Its corporate members include ExxonMobil, Johnson & Johnson, Wal-Mart and Koch Industries. ALEC claims that each year, close to 1,000 bills based on its model legislation are introduced into statehouses across the country. Of these, an average of 20 percent are enacted into law. Among other measures, the group is behind Arizona's "Show us your papers" immigration law, Wisconsin's move to strip public workers of collective-bargaining rights and the voter-ID laws that have so far passed in 16 states. Civil rights organizations now claim that ALEC, in partnership with the National Rifle Association, also influenced the reach of the "Stand your ground" law that has been evoked in the Trayvon Martin shooting. The shooter, George Zimmerman, claims self-defense and has eluded arrest under protection of the statute. The law — which allows people to use deadly force, without any obligation to retreat first, when they believe they are being threatened — was originated by the NRA and first passed in Florida in 2005. According to the Sunlight Foundation, a nonprofit watchdog group, ALEC followed suit by adopting the law's language for its model legislation and proposing it to state lawmakers. Near-identical laws have since passed in 10 other states, including South Carolina, Tennessee, Michigan and Mississippi. On Thursday about 300 members of the NAACP, National Urban League, ColorOfChange.org, People for the American Way and other organizations gathered outside ALEC's Washington, D.C., headquarters in protest of the legislation. Wielding signs with slogans such as "I Am Trayvon Martin," "Don't Shoot Me, I'm a Mom" and "Advancing Legislation that Exonerates Criminals," many participants also wore hoodies, which Trayvon was wearing the night he was killed. "We've come to pull back the curtain so that the world can meet the team of ghostwriters who have written these 'Kill at Will' laws and spread this poison around the nation," National Urban League President Marc Morial roared to the multiracial and multigenerational crowd, pointing at the nondescript office building for emphasis. The attendees also delivered a letter demanding that ALEC disclose all NRA funding and pledge to stop promoting "Stand your ground" laws. Rashad Robinson, executive director of ColorOfChange.org, which last year launched a campaign against ALEC for its role in drafting voter-ID laws, also took the megaphone. "Today we redouble our efforts on the American Legislative Exchange Council, not just to mobilize against them but to mobilize against the corporations," he said, referring to the dozens of companies that bankroll the group. "You cannot come for black folks' money by day and then try to take away our vote, or support laws that take away our lives, by night." In a statement, ALEC confirmed that it drafted model legislation based on the Florida law but rebuffed accusations that it is responsible for the idea. 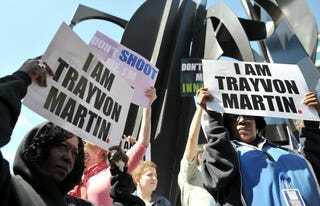 The organization also criticized activists for exploiting Trayvon's death to score political points. "Florida's 'Stand Your Ground' law was the basis for the American Legislative Exchange Council's model legislation, not the other way around," said the ALEC statement, going on to express doubt that the law will ultimately apply in the Trayvon Martin case. "It does not allow you to pursue another person. It does not allow you to seek confrontation. It does not allow you to attack someone who does not pose an imminent threat. What it does is allow you to defend yourself and your family from immediate and real danger." Asked for his response to the ALEC position that "Stand your ground" was designed to protect those defending themselves from "imminent death and great bodily harm," and not necessarily people like Zimmerman, Morial was unmoved. "The law is a criminal-protection act," he told The Root. "It sanctions, encourages and suggests that it's OK to attack a person if one feels threatened. It's bad public policy, and I think if ALEC has that position, they should lead the parade to repeal the legislation."